MADISON (Tuesday, Jan. 29, 2019) – A crawfish boil for friends and family, a barbecue deck party for fall 2019 football season and a chance at $10,000 are at stake at the 25th Annual St. Joseph Catholic School Draw Down. Tickets to the event, set for 6:30 p.m. Saturday, Feb. 23, are available at the school or online at www.stjoedrawdown.com. Admission is $130 a couple, which gives guests a shot at the $10,000 grand prize as well as a chance to bid on the crawfish boil, the deck party and other prizes. “Where else can you have an exciting night out with friends, enjoy great food and desserts, have a chance to win $10,000 and show your support for a longtime, well-respected educational institution?” St. Joe Principal Dena Kinsey said. Guests attending the Jeans, Jazz & Bruin Blues Draw Down will be treated to a buffet meal that includes seafood gumbo, boiled shrimp, beef tenderloin, fried catfish, lamb chops and more. Guests also will enjoy a host of gourmet desserts and an open bar. The event will include live and silent auctions that will feature vacation packages, sporting event tickets, fine art pieces and more. They also will be able to take a chance on several raffle packages with some valued at more than $1,000. Besides live and silent auctions, the Draw Down will feature a “Wall of Wine” in which guests buy a numbered cork for $25. The number will correspond to a bottle of wine that could be valued as much as $100 or more. 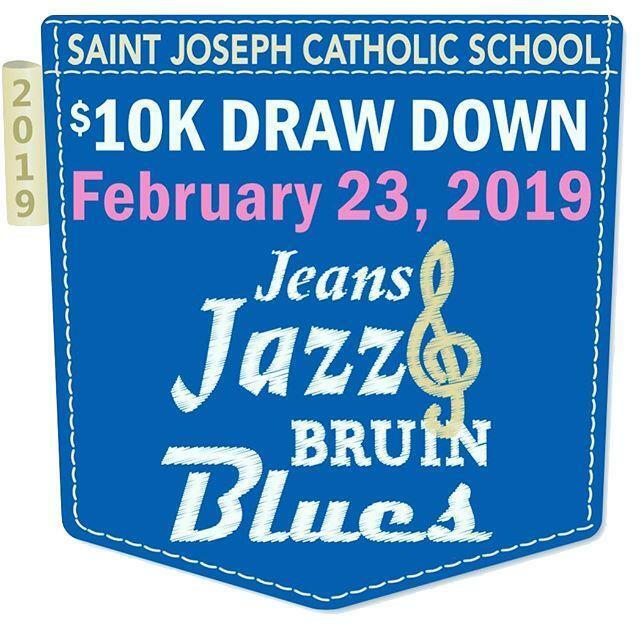 Guests also can buy “Bruin Bucks,” a $10 ticket they can use to take a chance at winning several elaborate, themed prize baskets packed with gifts and gift cards donated by St. Joseph classes, parents, faculty, supporters, community partners and staff. Tickets to the Draw Down are limited to 550. Anyone interested in attending should purchase their tickets before they sell out. Money raised by the event will be used to enhance student educational experiences. “This is a once-a-year event well-worth attending,” said Kinshasa Watson, a St. Joe parent who is chairing the event for the second straight year. Here is a look at St. Joseph Catholic School’s largest annual fundraiser. 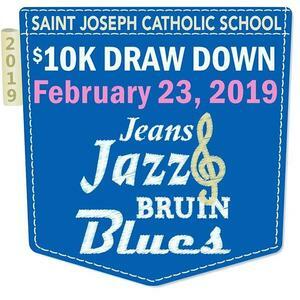 THE EVENT: Jeans, Jazz & Bruin Blues Drawdown 2019, a reverse raffle for $10,000 in which the last name called wins the grand prize. THE TICKET: Your $130 ticket admits two people; gives you a chance at the $10,000; and allows you to participate in live and silent auctions. THE FOOD: Guests will dine on gourmet food prepared by the Knights of Columbus of St. Francis of Assisi Catholic Church in Madison; guests also will enjoy an open bar. ACT NOW: Purchase your ticket at St. Joseph Catholic School, 308 New Mannsdale Road in Madison, or online at www.stjoedrawdown.com. Only 550 will be sold.